Overall, Atlanta’s real estate market continues to show mostly positive signs as we head into the fall and winter months. High buyer demand and limited inventory of homes for sale has continued to push sale prices higher. The number of pending sales has continued to climb, bringing the number of closed sales up with it. We’re still adding more new listings than we did last year, but with more and more homes selling, the available inventory is down compared to last year. Mortgage rates remained low throughout the entire summer, helping fuel buyer demand. Despite some occasional fluctuations, the national average for conventional loans hovered around 3.4% from June through most of August. We have seen mortgage rates climb this month, but they still haven’t surpassed 3.6%. It’s hard to say where rates will go from here, but I anticipate some volatility due to the upcoming presidential election and the economic uncertainty it creates. The following market trends come from FMLS single family attached and detached listing activity. 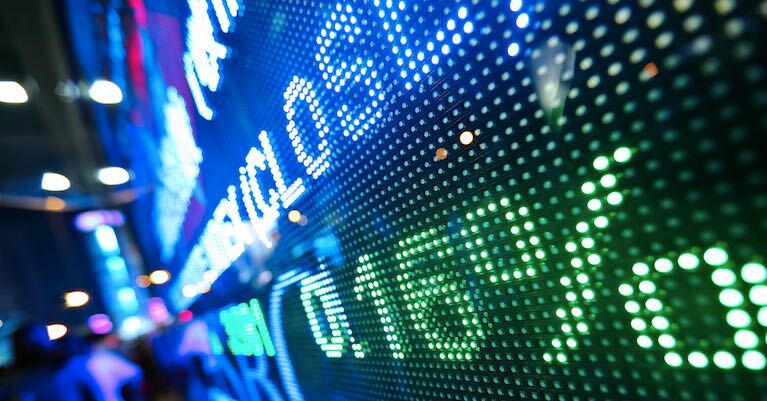 This month’s market report includes active, pending and sold data through August 31st, 2016. 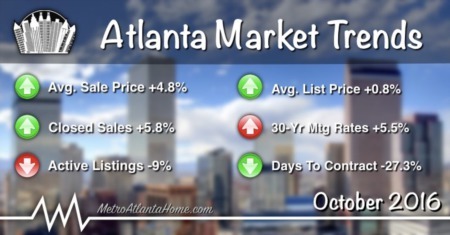 Last month, the overall number of closed sales in Atlanta increased 2.3%, to 7,381. This includes 6,226 detached homes (up 0.8% YOY), 657 townhomes (up 13.7% YOY), and 497 condos (up 9% YOY). After a sharp decline in July, the number of closed transactions in August remained consistent with historical trends for this time of year. However, bank-mediated sales (distressed properties) were down more than 52%; a contributing factor to the slowdown in closed sales. As I mentioned before, condo and townhouse sales have been up recently. As you can see in the chart above, we started seeing a spike in the number of condos/townhomes sold starting around March of 2015. I don’t know for sure, but I’d guess that a spike in new construction of condos and townhomes has resulted in more of these property types being sold. New home builders are now making up for the years of little to no building that went on after the real estate market collapse a decade ago. 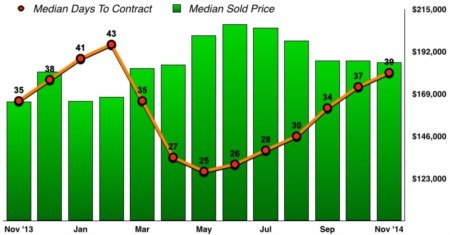 As you can see in the chart below, the median sale price of homes has continued its roller coaster ride upward, hitting a five year high this summer of $225K. It’s almost hard to believe that we saw the median sale price hit $91,000 less than five years ago, yet we’re now up to well over two hundred thousand. Despite the slowdown in appreciation, the median sale price of homes will likely continue to see positive growth, even as we head into the time of year where real estate sales begin to slow. Although it dropped from the June/July peak of $225,000, the median sale price of homes in Metro Atlanta remained up compared to last August. A 9% year over year increase shows that home prices are still on the rise as inventory remains low, buyer demand is high, and interest rates are favorable. 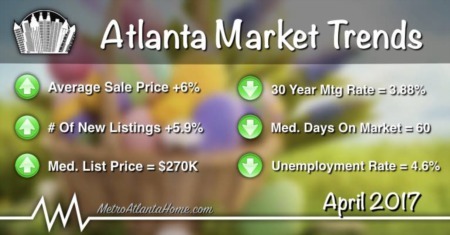 Similarly, the average sale price in Atlanta was up 5.8% last month, settling in at just over $274,000. More than 10,400 properties hit the market last month, representing a 5.8% increase from the same period last year. 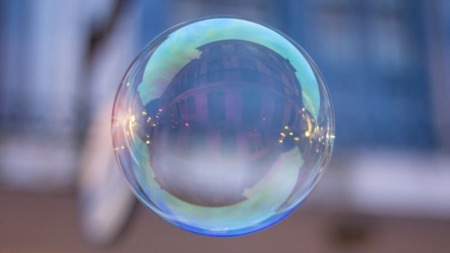 Despite the number of new listings trending upward over the past few years, the active inventory of homes for sale has failed to achieve any kind of significant growth. This is a result of increased pending sales which usually end up as closed transactions. Homes no longer sit on the market for months, they go under contract quickly, and sell. However, if the inventory is able to grow, we should start to see a more balanced market with price appreciation in line with historical norms. Going back to September of 2011, you can still see the tail end of the dwindling supply of homes in the chart above. However, the dramatic shift from a buyer’s market to a seller's market happened as the inventory level dropped sharply in 2012. Having a low supply of homes for sale is not a bad thing, it just causes an imbalance in the market. The shift back to a seller’s market in early 2013 helped clear out foreclosures and has allowed home prices to rebound. Continuing the trend that started at the beginning of 2016, year over year pending sales were up again last month. New pending sales for all residential properties hit 8,376, which was 20.6% more than last year. All these new pending sales added to the number of total pending sales, since the number of closed transactions increased only marginally, as I mentioned earlier. After reaching a nine year high in July (13,602), the total number of pending sales fell to 12,836… still 44.5% more than the same period last year. As you can see in the chart above, there were 4,926 new pending sales of single family homes in August 2014. This represented a meager 0.8% increase from the prior year. However, a year later (Aug 2015), new pending sales jumped to 5,848; an 18.7% spike. This August, the number of sales was up again, surging 20.6% higher than the previous year, finishing up the month at more than 7,050 homes under contract. I’ve said it over the past few months, and it still rings true today… homes are going under contract extremely quickly! In Atlanta’s current real estate market, good homes go under contract in days, not weeks or months. In fact, the figures would probably be lower, but many sellers elect to go with a "highest and best" period when they’ve received multiple offers. This usually extends the length of time before an offer is chosen and the binding agreement date can be established. Otherwise, many homes would be under contract the same day they hit the market! 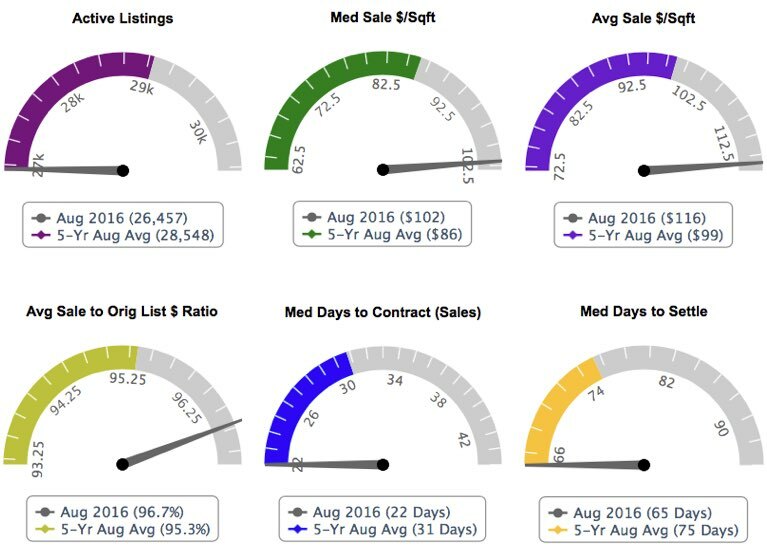 The chart above shows the average days to contract for homes, townhomes and condos. The general trend has been downward over the past five years, but I found it interesting how single family homes have gone from being the quickest, to the slowest, to go under contract. To me, this shows that buyer demand is high for condos and townhomes, and their popularity has returned. It makes sense, though. There’s no longer an over-supply of attached properties, and banks are more willing to make loans on these types of homes.